The Leader Accessories Super Mag Hauler is the only deer cart that has the highest weight load capacity on our list. With a 20-25 lbs lightweight design, it can haul loads that weigh up to 550 lbs weight, thanks to its heavy-duty steel construction, which delivers plenty of strength for transporting heavy loads. The welded square tubular-steel design folds down for easy storage, while its 2 buckle straps fix deer firmly on the cart. But our test revealed that the cart is a little bit bulky, even after folding it. And that can be a pain, bringing it with you in your truck. Part of this bulkiness is attributed to its heavy-duty frame, coupled with the tarp, which isn't as sturdily built as I expected. But the Leader deer carts redeemed itself by offering 20" puncture-proof tires with spokes and steel rims. The large wheels will go over small logs and other obstacles smoothly without flipping off. Do ensure to keep the spokes tight, so they don't get lost. One of the main reasons why the Best Choice products DEER game Hauler was able to make it to our list is because it can stand head-to-head to with the Rage Powersports GAME and give it the fight to remember. For starters, this hunting cart comes with the same weight capacity and solid steel construction as well as a heavy-duty steel axle, which is sturdy enough to pull 3 large mule deer over rock, sagebrush, swamp, and hills. Just like the Rage Powersports GAME, the Deer Game Hauler offers a 500 lbs weight capacity and Brown powder coated finish axle for extra durability. You will still get the same 18.5-inch solid rubber wheels, a minor assembly without the use of any specialized tools and an included 2 buckle straps. But one of its drawbacks is that it is a little bit heavy, weighing about 30 lbs as opposed to the Powersports GAME cart that weighs only 16.6 lbs. 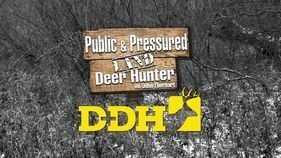 But the Deer Game Hauler moved a step up by featuring removable wheels for easy folding and transport. If you think the Guide Gear Deer is lightweight and the frame foldable, wait till you see the Rage Powersports. While the Guide Gear Deer keep boasting of a low center of gravity, the Rage Powersports GAME gives it a knockout by offering a Heavy duty ¾ inch steel axle for easy movement to your preferred location. Yes, the weight of the Rage Powersports GAME is lighter than the Guide Gear - it sports a lightweight design of 16.6lbs, with the capacity to transport game weighing up to 500 lbs. Of course, this is better than what the Guide Gear or any other deer hauling cart tends to offer. This cart is durable enough to haul heavy stuff over rugged and rough terrain- thanks to the included straps that help to hold down the buck, so it stays firmly in place. Even when the Guide Gear Deer decided to flaunt its punctured-proof 16-inch solid rubber wheels, the Rage Powersports GAME- came out strong, and bought the heart of many by featuring 18.5" solid rubber tires coupled with spokes and steel rims for smooth movement of the game, even in a sandy beach. Please note that while the thin wire and spokes are both stable and stay free of debris, they are liable for collecting sticks and twigs along the way. That said, the Rage Powersports GAME wields a modest setup that is hassle-free and doesn’t require any specialized tool but spins things up by delivering a foldable frame design for a compact and easy storage. My main complaint is that folding the cart is a little bit inconvenient as you will have to take off the middle rail before folding it up, which is quite a pain. Every deer carts need to have a low center of gravity that places the weight over the axle to prevent it from tipping off and for smooth movements of your game. If you’re using a game cart like Guide Gear, that has already been taken care of for you. With a low center of gravity function in place, you can simply load the deer in the cart so it gets balanced over the axle with less weight on the handle. It also offers you steel frame design that folds flat for easy transporting. With that said, we have more to be optimistic about this deer cart as it also comes with a lightweight design of 28.31 lbs and with a 300-lbs weight capacity for hauling big games, treestands﻿﻿, or other hunting equipment. Another great thing about this deer carrier is that it doesn’t come with wheels that can be punctured. It provides a puncture-proof 16-inch solid rubber wheel that can easily roll over shallow streams, downed trees, and other harsh terrains. However, I’ll advise you not to use it on a muddy ground because of the small wheels that are on it. Also, the pins are not that sturdy as they tend to push out when loaded down. With that said, the cart still stayed ahead of the curve by offering you with 3 durable lashing straps to hold big bucks and other hunting supplies for extra security when trudging through uneven terrain. 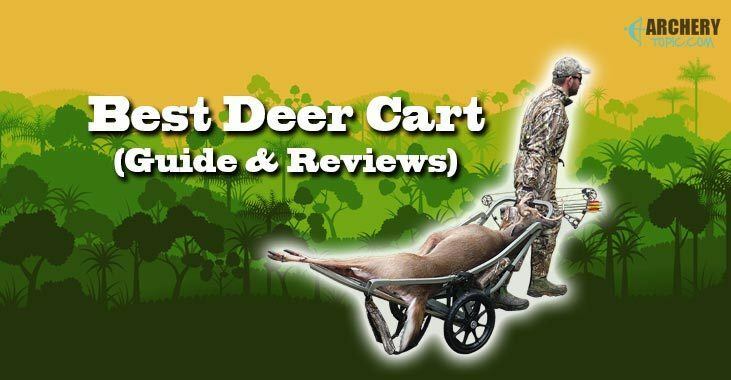 The Gear Guide Aluminum Deer cart really smoothens the process of carrying downed deer with ease by delivering a balanced design that has zero weight on the handle. It’s incredibly durable and features a silent puncture-proof, 16" solid rubber spoked wheels, that can conveniently roll over rough terrain, small streams, deadfalls, and uneven paths. Even though this happens to be the only cart on this list that's made of an aluminum material and a lightweight design of only 21.5 lbs, without exerting much energy dragging trophy game, it’s still amazingly strong and solidly constructed to be quiet as you haul your trophy game to your truck. But I noticed that while the wheel is big enough to maneuver most terrain, the rubber wheels smell terrible. If deer get to smell the cart, it might probably run off. So ensure you leave it outside for at least two days before bringing it to the woods. Also, the Guide Gear Aluminum Deer Cart can haul up to 250 lbs, which is on the low side, considering how sturdily built it is. So, regarding weight capacity, the Aluminum Deer Cart seems to be on the bottom of the chart. But don't count it all out yet, as it appeases its fans by offering a frame design that folds like a pancake for easy and a compact storage in your vehicle. I must say that this game carrier is not perfect to haul deer in all terrain; however, it can still handle most obstacles thrown at it. That said, I also noticed that the hitch pins, which holds the wheels and locks the axle in place are flimsy and not well made. There are a lot of deer carts on the market. You don't want to make the mistake of buying just anyone that catches your attention. That is why we recommend you consider some key features before making a buying decision. So, what are the things you want to keep in mind when shopping for the best game cart for deer ﻿﻿hunting? Below, are some important factors to keep in mind. Make sure you consider the weight capacity of the cart you want to buy. 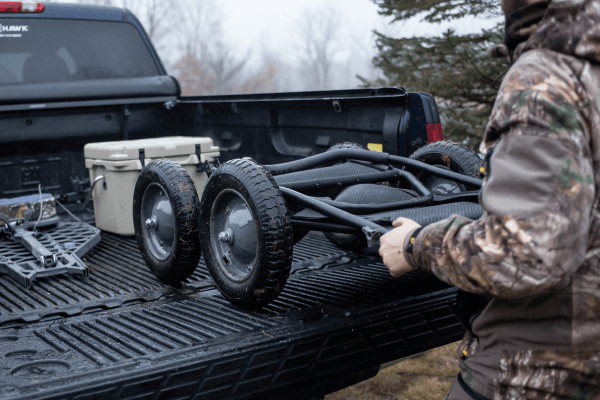 If you are going to use the cart to pack other hunting equipment like stand, backpack, bow, as well as to haul your game to your truck, then you want to go for a deer cart that is strong and weighs about 200 lbs to 300 lbs. But, if you plan to bring back a lot of deer with you, then you need to invest in a big game cart that has heavier frames and can accommodate loads that are up to 750 lbs. To prevent your kills from topping off the cart, you want to go for a game cart that offers a robust strapping mechanism. Ensure that the straps it comes with are strong enough to hold big bucks and other equipment firmly as well as to give extra security when hauling it through uneven terrain. If you want your cart to trudge through bumpy or rugged terrains without any hindrance, or being stuck in the forest, then consider buying the one that features large wheels. Our research and experience show that deer carts with large wheels roll over most logs pretty well. Apart from that, they are very easy to drag over all types of rugged terrain and do not sink on muddy grounds. One of the critical features of well-constructed carts is that they have a low center of gravity. 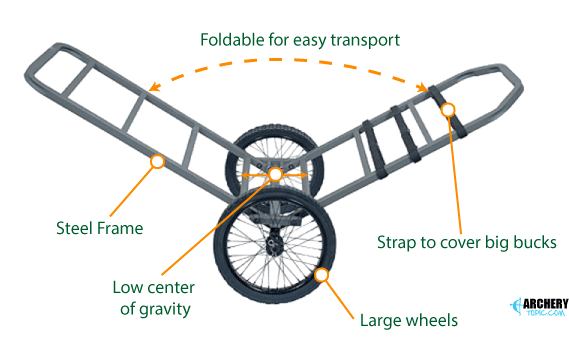 If it’s too high, then there are chances that the cart will tip over and cause unneeded stress on the axles and wheels, especially when moving on uneven terrain. I have seen some old cart that sat too high, and couldn't go 50 feet without tipping off. This is because the weight of the cart sits high above the axle, which is likely to tip over easily and cause you undue stress and discomfort. So, ensure you go for the best deer cart that has lower gravity and also comes with angled wheels that won't tip over if you mistakenly bump on a molehill. Aside from that, the frame of a deer cart is as important as its overall construction. We recommend you go for carts that are equipped with solid frames and sturdy wheels. A game cart with a solid frame will serve you for a long time and will be readily available for your next hunting trip. Deer carts are mainly made from two materials, which are Aluminum and Steel. Carts that come with ﻿﻿aluminum are very desirable and lightweight. This type of carts can easily trudge through rugged terrain and survive the deadly blow gotten from such journey. While carts made of steel are very tough and resilient to harsh conditions, they can't survive the same extreme limits as aluminum without ripping or cracking off. The best part is that aluminum doesn't rust as opposed to steel. But one of the main reasons why most of the best carts we reviewed are made of steel is because steel is harder and tougher than aluminum. And that is a crucial factor to consider when hauling big games out of the woods. Steel is Herculean strong and less likely to warp, bend or deform under weight, heat or force. It is two times denser than aluminum. And this is why we recommend going for a deer cart whose material is made of steel for a better hunting experience. Still on the frames; aside from it being sturdy and reliable, you also want to keep an eye out for carts that offer frames that are flexible and can fold into two or three parts. If you want to use your game cart to haul a lot of hunting equipment, then a three-part frame will be an excellent fit for you. If you’re going to use it to transport games only, then go for a cart that features two-part frame. You also want to make sure that the deer cart you are choosing is quiet as a mouse. You don't want a cart that produces deafening sound as you move your game through the forest, which is quite annoying. In addition, this will startle other prey in the wood and drive them out of that particular hunting location for good. Before picking a deer cart, make sure it is dead easy to set up without the need for any specialized tools. Complicated carts can be a headache to assemble as they may be time-consuming. While making your decision on which cart may be the best one for you, consider how easy it will be to put it together. That’s my take on the best rated deer carts of 2019. These game carts may not be the best for everyone or for every hunting terrain, but from my view, they’re certainly at the top of the list no matter how you slice it. And if you're a little bit confused on which one to choose from, I recommend you try out the Leader Accessories Super Mag Hauler. This deer cart became our editor’s choice by being the only game cart that offers a lightweight design of 16.6lbs, with the ability to transport game weighing up to 500 lbs. Did I miss your favorite deer cart? I know there’s still a lot of great hidden gems out there. If there are any significant deer carts I missed that you feel needs to be added, let me know in the comments. I’ll check it out. I hope you found these reviews of the best deer cart useful. If you have any feedback about this list or want to know why I chose one game carts over another, drop your comments. They are open!